America's agricultural industry has been confronting changes in climate, available workforce, and technology. By 2050 the world population is expected to reach 9 billion and with an increased focus on health , fresh produce will need to ramp up production by at least 70% in order to feed the rapidly growing population. U.S. farms are incorporating innovative new techniques to combat issues of fertilizing and pesticides, spoiled/contaminated produce, lack of workers, and harvesting. Federal tax credits are available for companies performing research and development activities to alleviate today's farming and produce complications. U.S. farm belts like California's Central Valley have been struggling with dry winters and water rationing. California's Harris Farms, among many others, has lost over 3,000 acres due to water deficiencies . California alone is home to an annual $40 billion agriculture industry and the U.S. will need to incorporate smarter farming methods to increase efficiencies. China has received attention over the past few years due to their land pollution issues, which has cost the country 25 to 60 million acres of previously arable land. Due to a large industrialization movement and heavy fertilizer use, China is experiencing cadmium, arsenic, and lead pollution in large numbers . Since removing contaminants from land can take years, China and other parts of the world, including the U.S. with recent genetic contamination, are in need of novel developments in this field to adapt harvesting and produce accordingly. This is especially so in the wake of the worldwide non-GMO (genetically modified organisms) focus. Sensor and mobile technologies are now being incorporated to closely monitor essential farming activities. These sensors, in conjunction with cameras, are also collecting big data on many factors including soil moisture, weather pattern predictions, traffic patterns of pests, and infestations. This big data will lead to efficiency when dealing with extremely large crop fields of corn, wheat, and soybeans, as well as smaller fields. IBM has developed a weather-modeling service that uses big data analysis to predict weather occurrences. The 'Deep Thunder' system gathers temperature and moisture data and from on-site sensors. The sensor data is combined with data from the National Oceanic and Atmospheric Administration, the national Aeronautics and Space Administration, and the U.S. Geological Survey and processed on a supercomputer to create a weather model. Deep Thunder's accuracy is within a mile and can predict weather conditions up to three days in advance. Sensor technologies have been used on more durable crops such as grains and are now being adapted for more perishable crops. Further research and development activities are needed to seamlessly apply these sensor technologies to perishable crops. Mann Packing of Salinas, California is testing new GPS enabled sensors in pallets of outgoing produce which will constantly measure the temperature of the vegetables in transit. Mann Packing is hoping to better identify and prevent contaminations and spoiled produce through pinpointing where temperature discrepancies occur. The USDA's Agricultural Research Service (ARS) is working on two water saving sensor innovations for automated irrigation applications. Irrigation methods can tremendously increase groundwater and crop yields. 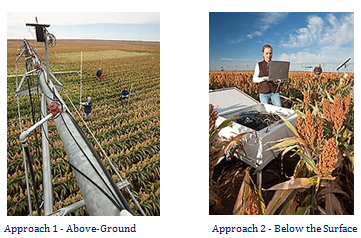 Above-Ground: this approach uses wireless sensors on above-ground irrigation systems to measure water stress levels of crops and supplies water according to stress levels. Crop canopy temperature and weather data is continuously collected and compared to an Integrated Crop Water Stress Index (iCWSI), when levels exceed the index, irrigations were triggered automatically. Below the Surface: this approach delivers water based on the water content of the soil. The sensors are placed 50 inches or more in the ground and measure the time required for an electromagnetic pulse to travel through the soil. Moisture slows the travel of the signal and the water levels are measured and recorded accordingly via computer. For places like California experiencing water shortages, these automated irrigation techniques can drastically alleviate the over 15% reduction of allocated water since 2011. Changes are already in place in areas like the Salinas Valley, CA. With a shortage of workers and acres of unattended crops, technology emerges to fill the gap, creating a new type of farming job. Automated harvesters are being used to harvest grapes, lettuce, strawberries, apples, oranges, and a host of other crops, requiring half the amount of workers, allowing for workers to do their job from machines rather than by hand. The Spirit Lettuce Bot, developed by Stanford alumni Jorge Heraud and Lee Redden, navigates itself through lettuce fields using its own Area Positioning System (APS). The 300 horsepower machines can respond to obstacles while they take pictures of crops. The Lettuce Bot compares pictures of the crops to a database of over 1 million images to detect weeds and overcrowding lettuce heads. When issues are detected, "the Lettuce Bot zaps the offending plant with a concentrated dose of fertilizer. The target is killed, while the surrounding crops benefit from the extra dose of food." This vehicle is particularly helpful to organic farmers who handpick weeds and don't use pesticides or herbicides. Shibuya Seiki and National Agricultural & Food Research Organization of Japan have introduced robotics into the agricultural sector with a strawberry-picking robot. Spanning ten feet long, the device is equipped with 3D stereo cameras and software that determine strawberry ripeness based on color. With 3D camera capabilities and a mechanical arm that snips the berries and collects them in its basket, the robot can pick a ripe strawberry every eight seconds. Although this technology saves farmers a great deal of time, increased R&D is needed to achieve the same keen human eye and aptitude that will harvest the same strawberry plant multiple times a week to pick the most ideal fruit. The Carnegie Mellon Robotics Institute has equipped a traditional crop harvester with advanced features. The Demeter project has developed a GPS and camera enhanced harvester that is capable of responding to obstacles and surroundings while navigating through crops and harvesting in straight lines. The automated Demeter can plan the harvest of an entire crop field; in a test run the Demeter harvested over 100 acres of alfalfa. The application of robotics to the agricultural sector presents tremendous opportunities to revamp and create new efficiencies within the multi-billion dollar industry. The use of robots introduces the ability to harvest at all hours of the day as well as cover more ground in less time. Companies engaging in R&D to get these innovative applications market ready are eligible for federal tax incentives. Agricultural equipment in the current market incorporates features like GPS, sensors, and cloud data analytics. The newest John Deere tractors are equipped with synchronization technology that sync with grain carts travelling alongside it. John Deere systems also feature cloud-based data access so farmers can monitor soil and nutrient levels. Agco's Fendt GuideConnect model allows a farmer to control two different tractors at the same time. Newer Fendt systems, which are able to pick up where one tractor has left off, will help reduce seed waste. The GuideConnect model uses a Real Time Kinematic (RTK) base station and GPS technology as well as wireless radio communication to connect the guiding tractor with the guided tractor. Agco anticipates the introduction of a fully automated tractor in five to ten years. George Washington University microbiologist, Professor Price, is using genetic sequencing to link bacteria in meat to infections found in Arizona consumers. Price's research focuses on the spread of antibiotic resistant germs from farm animals, specifically to women who then develop urinary infections. Resistant bacteria causes an estimated 100,000 deaths annually and there is a concern that the overuse of antibiotics is causing a host of drug resistant bugs and rampant infections. The sequencing of DNA will be able to trace germs from person to origin and provide answers on this debate. The full genetic make-up of store meat germs and germs found in people of Flagstaff, Arizona will be analyzed and compared to determine links between the two. This genetic research could help pinpoint areas of major agricultural health concerns. Eggland's Best is working on ways to improve the quality of eggs and increase nutrients such as calcium. Bart Slaugh, quality assurance director at Eggland's Best has researched and experimented with numerous hen feed recipes that increase vitamins, fatty acids, and taste of yolks. The current calcium content in an egg is 3% of the daily recommended value and Eggland's is working to increase the calcium to 10% of the daily value. Eggland's Best has already been producing eggs with lower saturated fat and higher levels of vitamin E and omega 3 and is engaging in continued research and development to reach the perfect egg. This year, Agco and many other companies have doubled their investments in advanced farming technologies. Bigger technological advances are needed for the industry and the new wave of 'smart farming' could increase farm yields by 10%. The development of innovative agricultural technologies is on its way helping combat current farming complications and higher demands. Companies performing research and development to further these advances may be eligible for federal R&D tax credits. Daniel Audette is a Senior Tax Analyst with R&D Tax Savers.